Reasons for Power Reduction on Wood/Chargas? - General Discussion - Drive On Wood! Reasons for Power Reduction on Wood/Chargas? I’m new to the forum, and am working on converting the Charwing, an 83 Goldwing, to charcoal. I’m trying to understand why we see a reduction in power when driving on wood/chargas, and what y’all have found to mitigate these issues. What I think I’ve learned is that the main culprits are the increased ratio of nitrogen to combustibles, and the lower enthalpy of combustion of carbon monoxide, particularly when running on charcoal given the much lower H2/CH4 numbers. Secondary reasons might be slower flame fronts inside the combustion chamber (I don’t really know what this means), and not advancing the spark ignition (don’t understand how this helps, but I believe y’all when you say it). I think the fixes proposed are recirculating the exhaust gasses (primarily CO2) to reduce the amount of N2, but not so much that the gasifier core falls below 900*C(? ), and advancing the spark ignition timing. Does this sound right? What other causes are there, and what else are we doing to mitigate them? Thanks in advance. Look forward to bringing the Charwing to the next meetup. Your engine is sucking the air thru the intake pipes at a value always smaller then the actual displacement. Ratio about 0,7 from the actual displacement. The higher the rpm, the lower this number gets. The easier breathing and less filter for the gasifier side, the more gas and air will enter your engine = more power. only build a filter to be used for short trips, use a secondary safety filter ( paper type ) if needed. You know when the gas is rich when you have to open the air mixture more… your gas is poor if you have to close the air more. No need for spark timing change, but can you send me a picture of your distributor side ? does it still have contacts or pickups with cdi ? Pumping loses are a huge problem. The engine is using power to draw on the gasifire. Its like trying to word hard while breathing from a straw. Second problem is low calorific value of fuel because of all the tramp nitrogen. The fuel gas is also slow burning so you can not speed up an engine to compensate for lower power output. Has anyone tried putting a scoop on the air inlet to force more air in once the vehicle is up to speed? Perhaps with a butterfly valve to moderate. This may also enable us to increase the CO/CO2 ratio. Is there any literature that talks about the factors contributing CO vs CO2 production? More simply, could we just open the intake diameter? What about going so far as running an open top downdraft gasifier? A updraft charcoal gasifier has by far the least pressure drop of them all. Make a good breethable filter and you got a wining sistem. It seems you fear you will have too litle power on the Charwing (love the name). The fear is unnessesery. You will not spin tires and burn rubber but you will drive like a boss. I had a 1000cc engine on my char powered Seat and had good acceleration, your bike weighs 5 time less so you will be launched like a rocket. I don’t fully understand the advantage in modifying the original ignition system. What is the waste of the original system? Koen you do not recommend a nozzle for the air to get into the coal at 25m / s? I have same question about "one coil per cylinder not one coil sparking 2 cylinders. i have recently been characterizing coil charge times for a couple of COP/CNP packs. I found that the 2-tower CNP pack took twice the coil charge time compared to the single COP pack. I wondered about that for a while, the assumed that, if one coil was firing 2 plugs, it SHOULD take twice as long to provide the same amount of energy to both plugs as for the single plug COP pack. 1990’s Toyota RAV4 two tower CNP pack. So, I still could be wrong, I guess. A piston and cylinder device, like an engine, converts pressure into useable work. A faster burning fuel, like gasoline, contains more energy on a volume basis, partly just because it is a liquid and woodgas is gas. However, a lot more of the energy in gasoline is unusable because it comes in the form a high pressure spike that the engine doesn’t know how to take advantage of. The two graphs may give you a rough idea of why this is true. 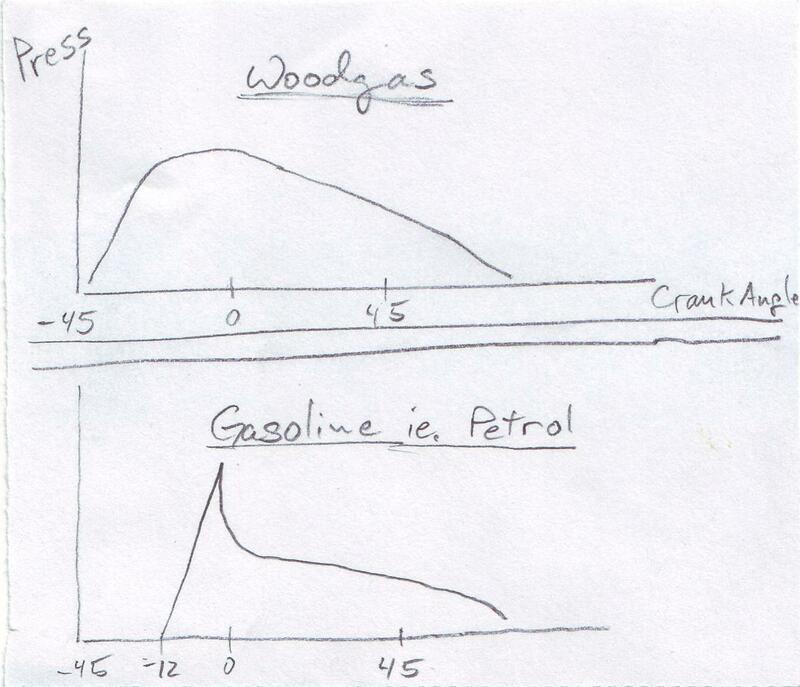 Now think about things that might cause the shape of the graph for gasoline to change. Have you ever noticed that engines seem to run better, and have more power on cold, wet days? This is because very small drops of water are going in with the air. These small drops absorb a lot of energy from the burning fuel and slow it down. Racers use this sometimes. They inject water to get more power. You ask a good question. Keep studying the basic processes. The ‘devil is in the deails’, thats true, but the answers are there too. I’m learning a lot and enjoying this topic. Just a reminder to not confuse water injection into cylinders which slows down the fast-burning gasoline, with water injection into the reactor which speeds up the slow-burning carbon monoxide by releasing hydrogen. I have used both types of water injection. Combining each with appropriate ignition timing change gives significant performance improvement. Water and carbon–the stuff of life and fun. at the end, 25m/s is at wot at a certain rpm and under load, his range is from 1000 to 8000 rpm, so needs tuning to find best low and max high. Thanks for the reminder Bruce. Koen, can a butterfly valve be used successfully on a larger than prescribed inlet to provide a wider range of air inlet velocities? Rindert, I appreciate you taking the time to draw that out. When water is injected into the cylinders, does it flatten out the pressure curve (bring down the spike and raise the tails)? Is it necessary that the water be a liquid still in order to absorb the spike as latent heat as it makes the phase change to a gas? Has anyone tried constant water injection at the proper ratio to woodgas, or are there negative consequences if you do this too frequently? Kristijan.Leitinger explanation is very good why you Don’t need to add water to a wood gasifier. Is it necessary that the water be a liquid still in order to absorb the spike as latent heat as it makes the phase change to a gas? No, steam would have a similar but reduced effect when compared to water droplets. The idea I wanted to get across is that just about anything that reduces the flame speed of the air/gasoline mixture will increase thermal efficiency but reduce engine power. Most automotive manufacturers these days recirculate some exhaust gas (EGR) under partial load conditions. This has a similar effect to injected water and the innert gasses present in woodgas. All of this applies to diesel engines also. I am not sure about Atkinson cycle engines or others so I’ll just stop there. I don’t know if anyone has tried water injection with woodgas. Note: racers actually use a 50/50 mix of water and methanol, I think this is to prevent microbial growth, and freezing in cold temperatures. Woodgas already has a lot of moister in it. I would not add more. I would not add water at all to anything gasification related unless you are trying to do some reaction chamber control and hydrogen cracking on a charcoal unit. EGR systems act by diluting the fresh charge and slowing down combustion a little. This also reduced peak combustion chamber temperatures ( the first reduces ping, the second reduces NOx ) . I don’t think Ping and NOx are problems on producer fueled engines. Right Bob, But here we were NOT suggesting water be added to the gasifier. We were exploring the possibility that it might increase power if added to fresh air as it enters the engine. I agree with that. But I’m still trying to find out if producer fueled engines’ (nice phrase Wallace) exhaust is hot. If so then maybe we could add a little weter mist and get more power. Also wonder if water mist might wash down soot and keep intake manifolds clean. I am not an expert on the tecnicles of wood gas gas, but with moble gasification units, the cooling tube weight size, and the other heat recycleing are all too rid the water before it gets too the motor, as a rule ad said before there is no need for water with wood gas moble units, if anything you will foul a plug if your cooling tube / hay filter is not big enough,and depending on how dry the wood that is burning is. This is my 2 cents only. Under some special conditions you might add water to a wood gasifier. I was kindly sent some tropical hard woods from India that burn like hard coal. They may have produced more gas with water. Red Oak, what I have lots of has more water than I need. Even when kiln dried it has water locked away in the wood I can not drive off. Too answer your questain about keeping intake cleaner, I and the rest of the non dakota gasers. More filtering after the hay filter if going too reduce the intake needs cleaning time or extend the time. I will try some towel filters and a hot filter is allso on my must complete list of projects. Lord Willing Soon.